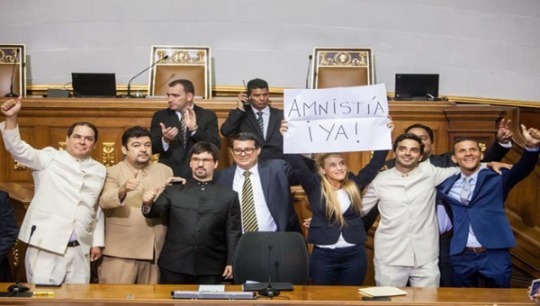 Opposition National Assembly deputies and activists celebrate passage of Amnesty Law in first discussion. The original Spanish language version of this piece was published in Contrapunto.com, February 23, 2016. In this article I will make reference to the Proyecto de Ley Amnistía y Reconciliación Nacional (PLARNA), which was approved by the Venezuelan National Assembly in first discussion on February 4, and has been published so that it can be debated publically. The following are reflections that might contribute to that debate. 1. What is amnesty? Etymologically the word amnesty is related to the term amnesia; it is related to a notion of forgetting certain crimes. In Venezuela the granting of amnesty is the competence of the Legislative Power (See article 187.5 of the Bolivarian Constitution and article 104 of the Penal Code), which may temporarily and retroactively repeal penal norms. Therefore: a) an amnesty extinguishes penal action and responsibilities to all effects; b) it stops judicial sentences and all its penal effects; and c) sentences are not to be counted in cases of reincidence. An amnesty law only leaves untouched civil responsibility. These principals can be found in any basic Penal Law handbook. An amnesty is essentially a political act in its motivation and justification, and this is why its legal and normative aspects take second stage. Amnesty laws are usually promulgated in contexts of high political conflict, and their function is to cool them down, thereby ensuring a minimum of stability and governability. But if an amnesty if related to forgetfulness, what happens to memory? 2. Amnesty and Memory. Discussions of memory are usually part of amnesty laws and cannot be sidelined. Because such laws are framed by political conflict, they are usually linked to power and transition processes between conflicting regimes, which adds a level of complexity. Amnesty processes aim to facilitate peaceful transfers of power between conflicting groups, and need to proceed with caution because today’s heroes often become tomorrow’s villains and vice versa, in a cyclical and dialetic relationship. What seems today very revolutionary or progressive, can be considered tomorrow profoundly conservative. Amnesty laws change with time. The Spanish Amnesty Law of 1977 is a case in point. It was meant to ease transition from dictatorship to democracy, but ended up being very useful tool for Franquismo. b) Special Decree by President Hugo Chávez (December 2007): by which a general amnesty was declared in favor of those who committed crimes related to the coup d’état of April 11 and 12, 2002, as well as in the oil strike that same year, and to all political events through December 2, 2007. These two laws had two basic points in common: a) they both aimed at cooling political tensions related to political polarization, so as to ensure a minimum of governability, which meant a process of negotiations between opposing groups, and; b) they both set limits to the time when the crimes which were covered by the amnesty had been committed. Thus considered, we have to carefully assess if the current PLARN should or should not be applied to events before the year 2000. The events before that year, and even those before 2007 according to the second Law Decree, have already been covered by the two previous amnesty laws mentioned above. Therefore I suggest the following modifications to Article 2 of the PLARN, and to page 6 of its exposition of motives: “…punishable offences, committed from December 3, 2007, until the date fixed by this Law.” This would mean that the law would have a true progressive character in historical terms and would include events which have not effectively been considered by previous laws. I also suggest that the paragraphs a, b, c, d, and e of article 7 be suppressed, unless the events described in them were not covered by the Special Law Decree of 2007, which includes instigation to commit crime and civil and military rebellion for that period. Articles 10 and 11, and paragraph c of page 6 of the exposition of motives, should also be suppressed. E) the Guatemalan National Reconciliation Law of 1996, about which the IACHR said in 1998 that “in Guatemala there has existed and exists to this day a state of impunity … by which is meant a lack of a investigations, prosecutions, arrests, trial, and sentencing of those responsible for violations of rights protected by the IACHR, and which the State is obligated to pursue with all legal means at its disposal because impunity propagates the chronic repetition of violations of human rights and the total defenselessness of the victims and their families.” (Dondé 2010:265-266). These are but a few examples of these types of legislations, which, while they respond to diverse circumstances and contexts, have all been seriously questioned by international bodies and human rights organizations given that they have implied immunity for crimes such as genocide, force disappearances, illegal detentions, tortures, homicides, and murders. There is a need to debate all these issues so that PLARNA does not lead to impunity. This concern is in fact stated on page 3 of the exposition of motives of the law. It is very important that the PLARNA does not become a tool for those who seek impunity for crimes that are not political in nature. In the current Venezuelan context it is not unheard of for common criminals and political leaders to collude. Corrupt politicians under investigation could also seek to take advantage of the law. In such a context, the discussion of impunity should not only refer to the exclusion of war crimes, crimes against humanity, and serious violations of human rights (as stated in article 29 of the Bolivarian Constitution.) Given the high homicide rates and use of fire arms in the country, impunity should also be avoided for this type of crime. Serious problems with impunity are constantly mentioned by local media in Venezuela. Political leaders should not promote the impunity of these types of common crimes that affect all Venezuelans. In consequence, I also suggest the suppression of Articles 4.O (use of minors in criminal offenses against the interest of children and adolescents, Article 8 of the LOPNNA); 4.S (criminal offences of a military nature); 4.V (illegal possession and use of fire arms); 4.X (for its generality); 7 paragraphs: j number 6 (possession and traffic of arms and explosives); 10 and 11 (which not only return to the events of 2002, already included in the Law Decree of 2007, but even more serious, they leave open the possibility of impunity for serious crimes such as homicides, because they nullify the exclusion of crimes made in articles 4 and 5. The allusion to article 10 made in article 5 should also be suppressed); 17 and 22.b (impunity for corruption cases–the allusion to article 17 made in article 36 should also be suppressed), 23 (of military nature); 30 (impunity for cases of drug trafficking); 31 (impunity for scams and frauds linked to the constructions of housing units); and 35 (impunity for corruption cases). 4. Importance of clarity and transparency. I suggest the detailed revision of articles 14, 19, and 21, which lack clarity. In some cases they seem unnecessary because they are included in previous articles. In other cases they seem to refer to economic and not political offenses. Some could even be discriminatory against interested parties that have not had access to international bodies. 5. The Judicial Branch as a problem. In a previous article I made reference to the lack of legitimacy and credibility of the Judicial Power, which has an important role to play in this issue. Amnesty should be a tool to resolve political conflicts and not to correct legal flaws. With an amnesty law we will not solve the structural problem of lack of trust in the justice system, a problem which goes beyond a mere substitution of actors and political forces. 6. Laws are not magic wands. Legal fetishism is an unhealthy component of our political culture. People tend to believe that legal texts, in themselves, transform realities and solve problems. But laws, however important, cannot do much by themselves. Even a legal text of high quality will only be a piece paper and will not go beyond short term propaganda if it lacks: 1) the political will of those making the decisions; 2) solid institutions to enact it; 3) a program with clear goals which can be subject to evaluation; and 4) the real possibility of positively making an impact on peoples everyday lives. As I have written elsewhere, political, social, and security problems are not solved by publishing legal decrees. 7. The political will of both sides is fundamental. There is an atmosphere of tension and crisis in the country. An amnesty law could be an opportunity to lower these tensions, to build circumstantial bridges, and to ensure a minimum of stability and governability. But this presupposes a long process of negotiation between the government and the opposition. The sides in conflict should not kick the legs out from under the negotiating table; but they should not hand out blank checks either. They risk generating even more circumstantial problems by making the amnesty law into a problem in itself. They also risk increasing polarization and losing focus on the more serious problems of the country: the economy, inflation, scarcity, supply, citizen security, lack of control over security forces, common crime, followed by a long etcetera. Keymer Ãvila is a legal scholar and human rights activist at the Universidad Central de Venezuela.